Want to build an easy DIY farmhouse table for your rustic home decor the right way? These 23 easy and affordable project ideas with plans and instructions will help you do just that. Everyone needs a nice, sturdy dining table where they can sit, laugh, and dine with their family and friends. If you own a conventional dining table, why not upgrade to a DIY farmhouse table instead? No, we don’t have anything against regular tables – we just don’t think they have the charm of a solid, rustic farmhouse table! Such tables are built to last, they look good, and they also make for great conversation starters when you have guests over. This guide will help you do just that. 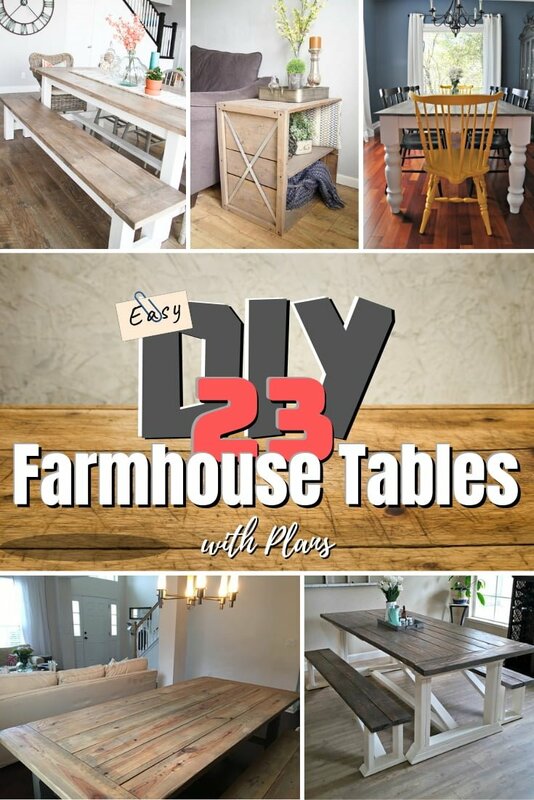 With these easy 23 DIY tutorials and plans with instructions, you will be able to build a farmhouse table even if you’re a beginner. If you are willing to get your hands dirty, you can build one from the ground up yourself — on a budget. Here are some spectacular DIY farmhouse table ideas with tutorials that will let you create an awesome table in no time. 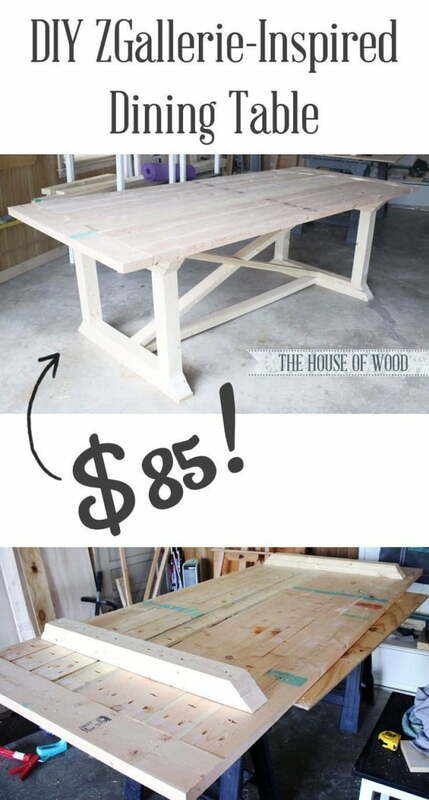 If you’re on a tight budget, you’ll love the DIY Farmhouse Table and Bench Set. You can make the whole thing for $100 or less. All you need are the usual tools – a saw, an impact driver, pocket screws, and cut-up wood pieces/planks – and you’re good to go. You can see this one is almost identical to the one above – except it’s fully painted and finished. It also includes replacement benches for your plain-and-sometimes-boring dining room chairs. The whole set is easy to make, is inexpensive, and should last you a long time. This table has solid square legs and an x-shaped section supporting the aforementioned legs together. If you want a solid, reliable dining table without blowing a few thousands on it, this is the one to get. Please click the link for the blueprints. This one is for the oak lovers out there. Oakwood is known for its super-high durability, though it’s very expensive – unless you build it yourself. By following these plans, you will get a roomy, comfortable table with benches for your kitchen. The Rustic Farmhouse Table can be built in two ways: the first will give the table X-shaped legs while the second will give it tri-pronged legs. The table – whatever style you follow – looks really rustic and could make for a good centerpiece for your hardwood floor. The Farmhouse Crate End Table is a miniature table that you can place in your living room. Not only does it make for a good showpiece, but it also has shelves for storage! It is easy to make and doesn’t cost a lot. Please click the link for instructions. 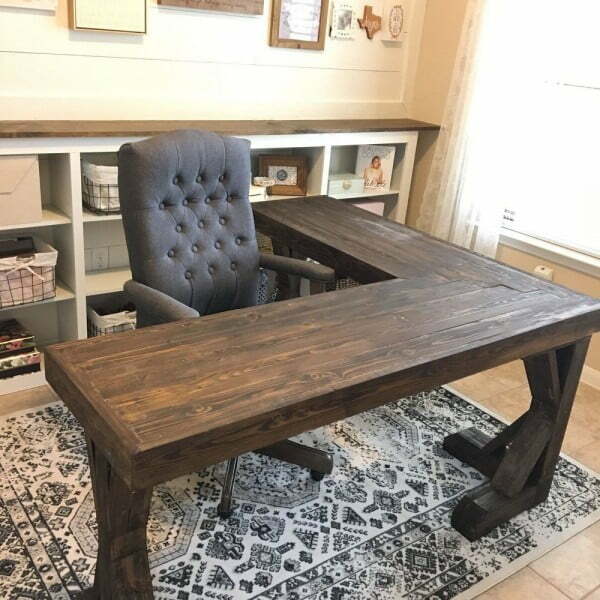 This farmhouse table has X-shaped legs. It’s solid, compact, and can fit inside your living room or out on the patio. You can build this from the ground up on a budget – all you need are some basic woodworking skills. Read the tutorial for more info. Farmhouse tables don’t have to be hard to make or expensive. If you can spend some money on pre-made table legs, you can make your own frame and attach that to it. The result is sturdy and can truly brighten up your dining room. This is a really lush, elegant-looking table. If you can get your hands on a table frame, you can use multi-colored pieces of wood for the top. That gives it a striped, colorful, unique look. It doesn’t cost much either. Read instructions for details. Need a farmhouse table you can place out on the patio or even the garden? You can build one if you have reasonably advanced woodworking skills and a thousand dollar budget. It’s expensive, but it’s very solid and should be worth it in the long run. Love the Keaton Dining Table from Pottery Barn? Well, now you can build a cheap imitation knock off at home without going bankrupt! All you need is tools, wood, chalk paint, and some patience. The result does not, in fact, look like a cheap imitation knockoff. If you’re in the mood to splurge a little, you can make a traditional walnut wood table with breadboard ends and conventional mortise and tenon joinery. The result is something that looks very classy and solid, straight out of a high-end furniture catalog. Cherry and White are classic colors that won’t look out of place in any house in the countryside. It’s easy enough to “refinish” your current table in the colors – just take apart your existing one, clean it, and repaint it. Refer the tutorial for full instructions. Farmhouse tables can sometimes go well with any antique pieces you have lying around. If you have a favorite old-style cabinet, chair, or bench lying around, you can build a farmhouse table to compliment them – and all under $100. No, it’s not a monstrously-sized table: it’s just been assembled from parts scavenged from various pieces of furniture. If you have an old table lying around, you can rip off the top and fit it on a frame you built yourself. The resulting mishmash looks surprisingly good and is very usable. You can build a no-frills farmhouse table from the ground up on a budget. All you need is wood cut into top boards, breadboards, legs, a long apron, and a short apron. Sand, stain and finish up assembling with glue. It’ll be basic, but it will look solid and will be very reliable. Armed with a power sander, oil primer, and wood stain, you can turn your old table chairs – as well as the chairs – into a classy, sleek farmhouse table. Giving your table and chairs a facelift isn’t expensive either. For full instructions on how to make the attractive table, click the link. You can create the Truss Beam Table with some tabletop boards, planks, and screws. The Truss Beam design lends this table a distinctive look. It’s also a very solid piece of furniture, something you won’t have to baby too much. Check the full tutorial for build instructions. Need a table that can be used as a desk in a pinch? All you need is some birch hardwood, treated lumber, poplar boards, plastic wood, a drill, and sanding block. The poplar is used for the frame, the birch goes on top, and the pine is for the legs. The result is a solid desk-table hybrid you’ll love. Functional, cheap, easy, and inviting are some of the characteristics that this table embodies. The top of the table has small gaps to give the table room to breath, and all it needs is a few 2x4s along with some of your own tools. It can be perfect for your patio or in your home. It is important to be unique, and you can use today’s look on your next project. 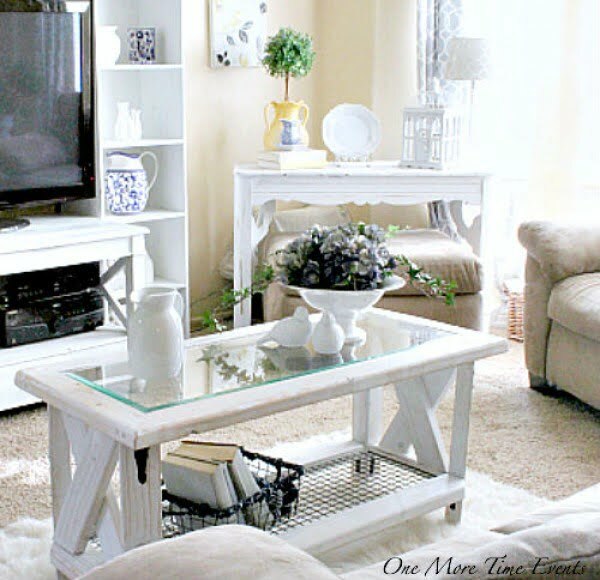 Again, using a few 2x4s, you can make a beautiful whitewash farmhouse coffee table. You are going to need a piece of glass to fit the table and complete the look.